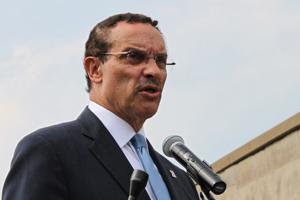 Mayor Vincent Gray has a vision for reshaping D.C.’s economy and two Kogod students will help make it a reality. Andrew Olson and Erin Monahan, both MBA ’13, are contributing to the advancement of Gray’s Five-Year Economic Development Strategy for the District, serving as mayoral fellows on the project’s Strategy Advisory Group. A collaborative endeavor between the public and private sector, along with the academic community, the hope is to catalyze business growth and job creation inside the beltway. Olson and Monahan will collect and analyze data from business leaders in seven industry sectors that will be used in planning the economic development strategy. “We’ll provide quantitative evidence to back a set of recommendations to the city that will comprise the main deliverable of the project,” Olson said. The three deliverables are an economic-impact model to provide a framework, a public-sector strategy for regulatory reforms, incentives and real estate investments, and private-sector commitments. Graduate students from other D.C.-area business schools, including Georgetown, Howard, and The George Washington Universities, are also contributing to the project. An advisory group, which includes elected officials, agency directors, university presidents, and top employers will formulate the final strategy. The final report, which will provide a roadmap for the District’s economic development, will be released in September.